The Cold Room is so far-fetched that Ellison felt the need to add an Author's Note at the end to say how far-fetched it really isn't." > The Cold Room by J. T. Ellison, a Mysterious Review. 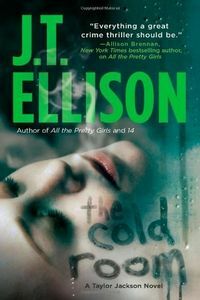 Review: Recently demoted Nashville homicide detective Taylor Jackson is called in to investigate an obviously staged murder scene that is eerily similar to several found in Europe … and under investigation by her FBI boyfriend and expert in behaviorial analysis John Baldwin, in The Cold Room, the fourth mystery in this series by J. T. Ellison. Il Macellaio — The Butcher — has been sought for a series of gruesome murders in Florence in which he tortures and kills women, then poses the victims to emulate famous paintings, leaving a postcard behind to let the authorities know exactly what he's done. But Florence is a long way from Nashville, as Taylor points out. Still, it's hard to deny the similarities. In Taylor's case, the victim was starved to death before being raped and moved to what is apparently a random, though carefully selected, location and arranged to mimic a copy of Picasso's Demoiselles d'Avignon, hanging on the wall of the room in which she was found. When a similarly murdered and staged victim is found in London, New Scotland Yard Detective Inspector James "Memphis" Highsmythe travels to the US in a coordinated effort to identify the killer — or killers — involved. The murder mystery plot in The Cold Room is so far-fetched that Ellison felt the need to add an Author's Note at the end to say how far-fetched it really isn't. That should be a clue right there; authors shouldn't have to be defensive about their books, even before they're published. Still, there could have been an element of suspense involved had Ellison not chosen to take an omniscient approach to writing the book; from the reader's perspective, there is nothing remotely surprising or thrilling to any aspect of this often lurid story. Worse, there's a rather silly pseudo-romantic subplot involving Taylor and Memphis that has absolutely no reason for being … other than as filler to pad the already overlong text. Ellison clearly did some considerable research here, but The Cold Room is the unsatisfactory result of a "fantastical" — an adjective the author herself uses to describe its premise — story that should never have seen the light of day. Acknowledgment: Planned Television Arts provided an ARC of The Cold Room for this review.